With the pre-order of the Freeport Bestiary opening up, I thought it would be worth taking a moment to discuss how to get the most value out of the book. Of course if you are running a Freeport game this is easy – grab monsters as appropriate. We build the book to make that easy! But if you want to use the Freeport Bestiary to add some spice to other classic fantasy campaigns that’s easy too! In essence this is a companion piece to my discussion last year about adding typical Pathfinder Roleplaying Game to a Freeport game, but in this case we’ll talk about how to select the Freeport-themed monsters for your other campaign ideas. Since a fantasy campaign can focus on just about anything, I’ve broken this conversation into specific information the Freeport Bestiary gives you that can help you decide if a specific creature is a good match for your game’s overarching plot. It’s true of nearly every bestiary, but it’s worth noting that we break down the monsters by CR, and every monster entry gives you information about its type, size, environment, and so on. Sometimes when building an adventure a GM just needs more choices for a CR 14 aquatic encounter, and having more choices to go through expands the odds that you can pick exactly the monster you need. We also talk a bit about what we mean by the various terrain entries, since for some reason monster terrain types don’t use the same terms as ranger favored terrains. We give a tactics entry for every monster in the Freeport Bestiary, for two reasons. First, GMs have enough to do without having to try to somehow divine what a monster designer had in mind when putting together a specific combination of a breath weapon, flight, and Flyby Attack. If there’s a specific way a monster tends to open each fight, or handle common enemy actions, we tell you. Second, diving the GM an idea of tactics can help pick out monsters that complement specific kinds of encounters. A drahc’s hit-and-run tactics work well in an encounter with lots of open space and room to maneuver, but we also discuss what it does if forced into close combat. If a GM wants to build an encounter where the tactics shift as the situation evolves, a drahc is a strong choice. Tentacle callers, on the other hand, just smash all their foes at once, and drive those that survive too long insane. They are perfect for facing a large group, but their tactics tend not to evolve. Each entry in the Freeport Bestiary has an “Encounters” section, which discusses common circumstances that are most likely to lead to PCs interacting with the monster. This can spark ideas for new encounters, but it’s also a handy guideline for a GM to see what monsters make sense for encounters that just need some extra muscle. These also help make the monsters in the Freeport Bestiary more than just a collection of numbers and keywords. In addition to common information such as ecology and physical characters that help a GM know where a creature is and what it looks like, the encounters section helps contextualize each one into a well-rounded potential threat. If a monster is going to be anything more than a blob of hit points and attack rolls, a GM has to know where it comes from and what motivates it. For obvious reasons these entries aren’t always very long, but it’s worth known that tentacle callers operate alone, each driven by its own mission, while drahcs are primarily motivated by hunger (but occasionally form a brief obsession with some specific thing that might cause them to form short-term alliances). These are the details that allow a GM to see what monsters make good minions, which should be used as random encounters in dangerous lands, and who is a good candidate for being in charge of a larger plot. Rather than just tell a GM that a monster’s treasure is “standard,” the Freeport Bestiary discusses what kinds of things thinking monsters desire, and in some cases what incidental valuables less intellectual monsters are likely to have on or near them. Some monsters also have a “Uses” entry, which discusses ways the monsters may be of value themselves. This is where a GM learns that goblinoids and orcs love the taste of flying lizards’s flesh, a hafgufa’s hide can augment the casting of various stone-related spells when added as a material component, and a captured living encrustation can be sold for 1,000 gp. For GMs looking to run encounters where players wish to capture rather than kill, or have the monster also be the treasure, the entries with these notes provide a baseline for what creatures fill such rolls well. In case a specific monster isn’t exactly what a GM needs, we also detail what method each monster uses to grow tougher. In some cases this is just the standard rules for gaining hit dice, but others suggest specific character classes or templates (especially the incredible useful templates in Green Ronin’s Advanced Bestiary) that can be added to boost a monster’s CR while maintaining its theme and tone. 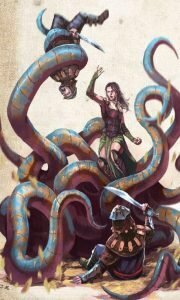 With scores of new monsters, spread over a wide range of CRs, creature types, environments, tactics, and motivations, any adventure can benefit from one or more of the options in the Freeport Bestiary, and we’ve done our best to give GMs the information they need to pick the best fit for each encounter.